Just as there's nothing better than a bottle of wine at the beach, cabin, or campground; there’s nothing worse than being stuck without a corkscrew. The table corkscrew from Screwpull is not only compact and lightweight; it's a sophisticated tool friends will covet. 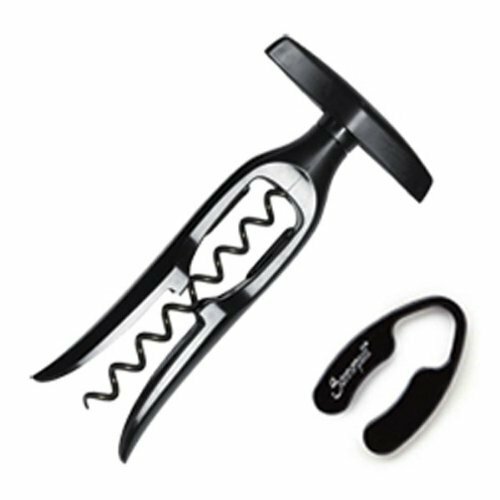 Not only does this clever corkscrew take the work out of cork removal for effortless bottle opening, it now automatically twists the cork off the screw as well. To open, simply pull the handle and the durable Teflon screw drives precisely into the cork's center. Push lightly the other way and the cork climbs effortlessly out of the bottle. Then, while holding the corkscrew panels (and not the cork); pull the handle again and--voila, the device pushes the cork off the screw unscathed! Pinch down on the sides to keep the cork from falling off, and reinsert it with the same ease. Finally, fold up the corkscrew and pack it away.